We know, of course, that not all jobs are created equal. Creatives, freelancers and managers may disagree on what makes a work accessory essential, but for the majority of us, we think we’ve narrowed down the right tools to get you started. 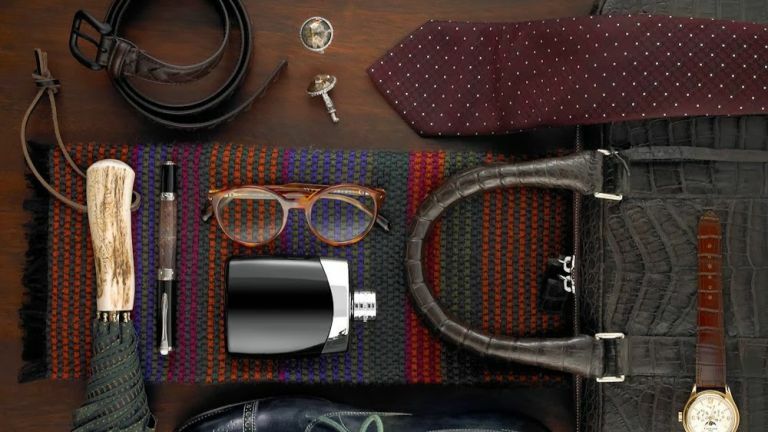 From stylish accessories to polish up your work 'look' to a grown-up pen that’ll save you scrabbling around for that ancient scratchy ball-point, to sophisticated options for transporting your tech from place to place ('bags', as those in the know call them) and much more besides. As far as workplace skills go, being on time is a pretty essential one, so stay punctual and stylish with this Baume and Mercier watch from Ernest Jones, which gets our top spot for the best men’s work accessory. This Swiss-made watch has it all: a clean modern face that’s easy to read, a little glamour from touches of rose gold, and a traditional textured leather strap all come together to give an understated yet undeniably stylish look. Plus, it gives you all the essential info without looking cluttered, so although that's achieved by ditching the seconds, it still gets a big hand from us. For when a satchel’s too twee and a briefcase too retro, this tech bag from Aspinal of London valiantly steps up to fill the gap. In chocolate brown Saffiano leather, it’s got just enough texture to keep things interesting, and is far more low-maintenance than Nubuck. With the rest all clean lines and modest branding, this sack looks smart for every occasion, from casual lunch meetings to tête-à-têtes with the boss. Add the battery pack from the same collection (sold separately) and it becomes a travel-ready powerhouse with cable paths and internal tech pockets to keep everything corralled and juiced up when on unpredictable away trips. When the iPad first burst onto the tech scene, the masses were a bit baffled as to why they’d want something that was neither a phone nor a laptop. Today, it’s an essential tool for business as well as pleasure, and the iPad Pro is the biggest workhorse of the bunch. It’s easily the best iPad for creatives, while for the rest of us it offers incredible portable processing power with a generous enough screen to not feel as if we’re compromising whether typing up documents or organising projects. Even dodgy commuter train Wi-Fi isn’t enough to take the shine off this beast. Even if your workplace tech isn’t as snazzy as the iPad Pro, it’s still indispensable, so treat it to the luxury it deserves with a trip in this handsome tech pouch. Made from durable and luxurious, vegetable-tanned leather, Mulberry's case can be carried underarm for more show-off factor or slid into a larger bag for work travel, and fits devices up to 10.5 inches wide and 8 inches tall. The branding is subtle, but the quality of the grained leather speaks for itself, and the on-trend oxblood shade makes a more exciting change from the usual black or brown. Altogether, both a stylish and sensible option. If you’re looking to impress at work, never be the person who’s scrabbling round for a scratchy, partly masticated ballpoint two minutes before a meeting. Calmly producing this instead won’t just give you instant cool points, it’ll give you an enjoyable, smooth, and discernibly high-end writing experience, whether you're taking down notes in your executive diary or noting down coffee orders on a Post-It. With quick-drying ink immune to smudging, a smooth line, and a classic black and gold colourway, it’s our all-round best pen for work. You know what they say about dressing for the job you want, not the job you have? You can take it as literally as you like with these Boss cufflinks. Made to last from enamel and stainless steel, they’re minimal and modern, perfect for adding the finishing touch to a smart office outfit. These understated circle cufflinks are a good way to show you’ve made an effort, without rocking up to the Office looking like Mr T. We pity the fool who does that. Lessen the environmental impact of your twice-daily coffee shop visits by nixing the disposables and bringing along your own travel cup: this KeepCup, specifically. Made from tempered soda-lime glass, it's engineered to be more durable than plastic with less of that telltale taste, and looks much smarter than your average sippy cup. The cork collar isn’t just a design flourish, it’s a handsome alternative to the cardboard sleeve that keeps you from burning your hands. Convenient, good for the planet, and just plain good looking: that’s what makes the best commuting accessories. Bringing your own lunch from home is cheaper, healthier, and usually a whole lot tastier than picking up a salt-laden BLT from the local sandwich shop, so do it in style with the original adults’ Japanese-style lunch box from Monbento. Made from high quality plastic, you can chuck it in the microwave and the dishwasher without worry, plus it’s completely airtight and leak-proof — some reviewers have even mentioned carrying soup in it. In a backpack! Having two tiers means you can keep sweet and savoury separate, or keep crunchies from getting soggy. Forget what you think you know about the limp-lettuce packed lunches of yore, and get on board with this Japanese marvel. Whether you want to trade up from your usual plastic protector or you’ve been left in charge of a work phone that you’re terrified of breaking, a grown-up phone case is always a good idea. This wooden classic from Native Union is our pick of the office bunch. Read more: If your business accessories need to support frequent travel, give this guide to the best long haul travel accessories from our friends at TheRadar a read.